Organizing your finances is important. But let’s make it as easy and as seamless as we can. In the early 2000’s, we started experiencing the ease of online banking. Many people were reluctant at first, and some continue to doubt the safety factor. However, what’s not to love about our smartphones, tablets and computers when they can make something less painful? 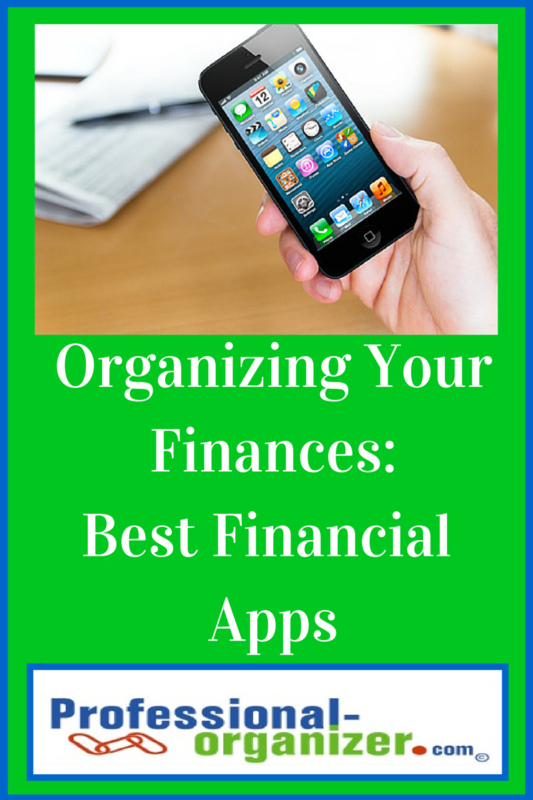 The best financial apps can make financial organizing easier. Not only can you make deposits without going to the bank, you can transfer money rather than send a check. Having your bank app on your phone means you can check deposits and account balances. The trick to keeping current on bill paying is to set a reminder to pay the bills! Reminders are great for paper or online bill pay. Set the reminder as a recurring event each month to act on your finances. Once a year it’s great to check your credit score. Your credit score impacts how interest on loans, how much you pay for insurance and mortgage rate. Keep up annually with this free app. I love to shop when I know I am getting the best price for an item. Using Red Laser, I can price an item by scanning the bar code and see where to purchase it most cheaply. There’s always groceries to buy! Why not share the responsibility by sharing the list? Grocery IQ builds a list that can be used by multiple smart phones. Whoever is on the way home can stop and get the milk now. Expense accounts can be time consuming! Simplify the process with this app that includes scanning your receipt and adding it to your expense form. I’d love to learn your favorite financial apps too! Sharing organizing and productivity ideas monthly! Join the fun by subscribing to my newsletter. “In every job there must be done, there is an element of fun. 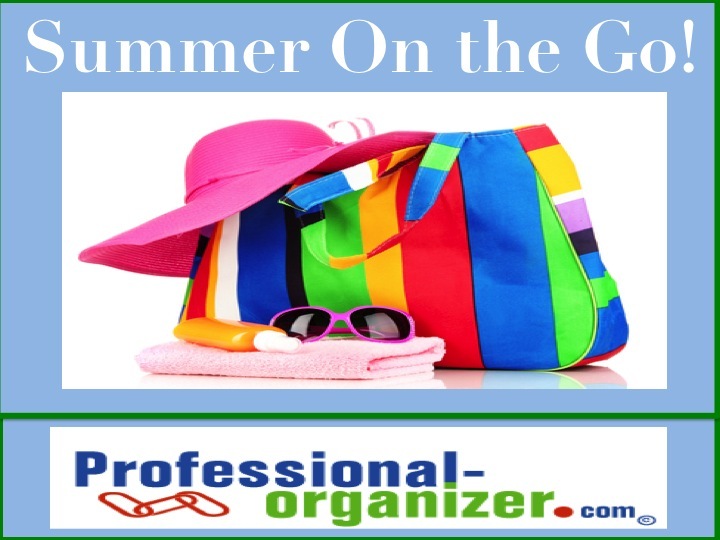 Have a little organizing fun this summer with your family. 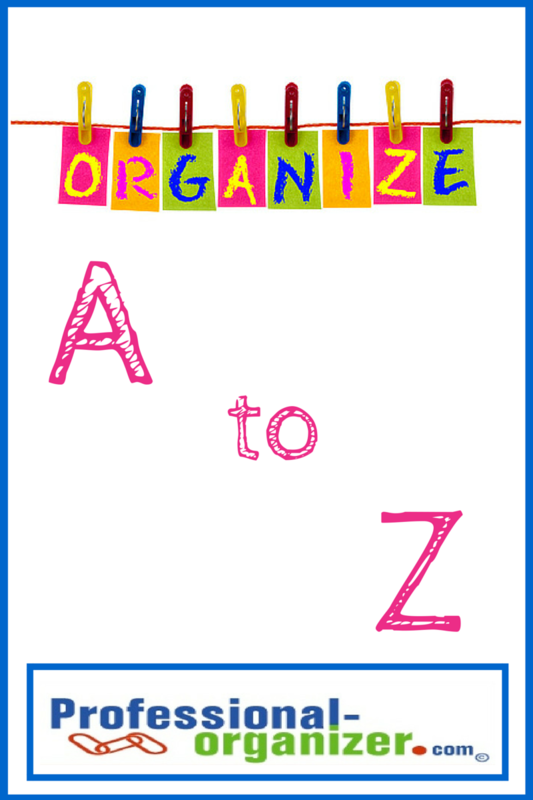 Our A- Z organizing days are little projects everyone can work on together to have a more organized home. Set aside 30 minutes at a time to declutter and organize these spaces. Just a little time spent makes a big difference! Q – quick catch up on a day you missed! Z – zip into your purse too! How do you make a job more fun? Organizing can be as simple as 1, 2, 3. Really? Yes! It comes down to great rules and routines that follow up your organizing. Get everyone on board in your family and it’s a piece of cake. 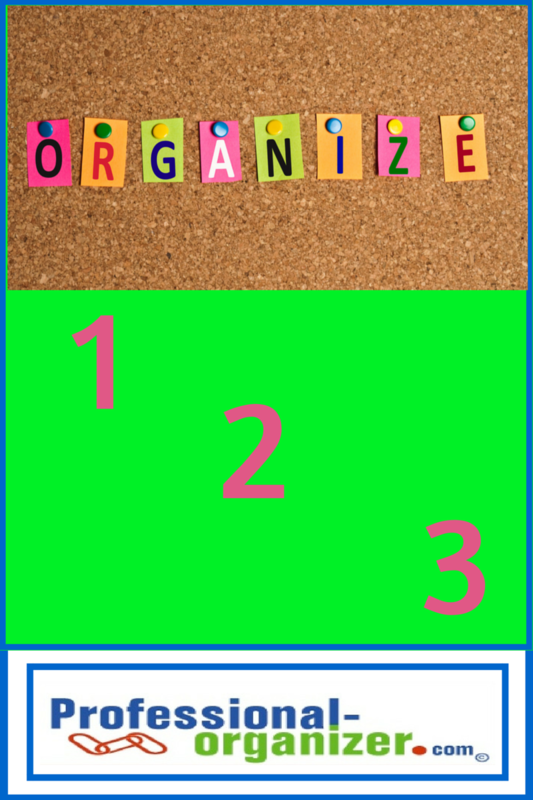 Here are my top 3 organizing rules. 1. If it takes just a minute, put it away right away. Most times we procrastinate about picking up because “we just don’t have time” since we are on the go. 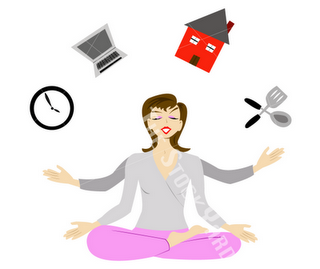 We have a lot of activities, we need to get to work on time, or we think it will take a lot of time to put stuff away. Create a rule for yourself that if it just takes a minute (or 2 or 3 minutes) just put it away asap. 2. Partner up! Any task is easier when it’s two people working together. It doesn’t matter if its creating a powerpoint presentation or unloading the dishwasher, when you work as a team everything is better. Partnerships can take many different forms. It can be family, friends or colleagues creating connections and working together. It can be a virtual partnership, like when you are on the phone or skype. Find a partner who helps do the job well and makes it fun too. There’s no clutter when everything in your home or office has a place. Match up items with their point of use, what room you will use them in and with other items you use them with. Store items by location to make it easy to access them when needed. It’s when stuff has no home, its on the counter or the floor for days. Be sure you always have a spot for an item before you purchase it too. When every single thing, that means everything, has a place there’s no clutter! What are your basic 1, 2, 3’s of organizing? Join the organizing fun with my monthly E-News! Summer is around the corner! 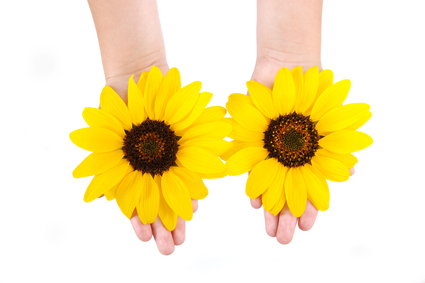 The fun of summer is our let it go attitude and our free spirit spontaneity. A little organization goes a long way to help summer fun. 3. Prepare a ziplock bag for each child with an emergency outfit in it. (Even older children get muddy socks or spill juice or something.) Keep in the vehicle. 4. Stock your vehicle with ziplock bag kits such as: stuff for fixing hair; sunscreen and lip balms; first aid; snacks; teeth-brushing stuff. 5. Prepare a little tub for the trunk with picnic-type supplies such as paper towels, napkins, spoons, small paper plates. So many times, we could then hit a grocery store for some healthier snacks, and saved by not doing fast food. 6. Sunglasses: For our family, it only worked to get inexpensive ones and keep duplicates. The best thing I did for myself (since I wear glasses) was to get the transition lenses so I don’t need sunglasses. I sit down with family members and compare summer calendars. Everyone has with flight/travel information, birthday plans and more! I try to keep summer items in the back of the car so I’m ready for any swimming pool or beach days (sunscreen, towels, bathing suit, extra flip flops)! I use summer as a time to reorganize at home. I always tackle my desk and shred old papers. I also go through all the clothes and shoes in my closet and donate to Goodwill. I don’t over plan the summer. I like to leave some open days to fill in as the summer goes on! Technology helps me keep it together “on the go”. We always hear that we are tethered to our devices, but actually devices help me NOT be tethered to my desk! Apps like “evernote” and “drop box” help me keep what I need at my fingertips. I use the calendar, alerts and alarms to let me tune into work as needed rather than 9-5. It even helps me get moving by tracking my steps and fitness. Adapting my phone to support a lifestyle that is always on the go has helped RELAX and UNTETHER from work more. I can go have fun knowing I can check in if needed remotely. One of the most powerful parts of social networking is connecting to bloggers through Blog Elevated. 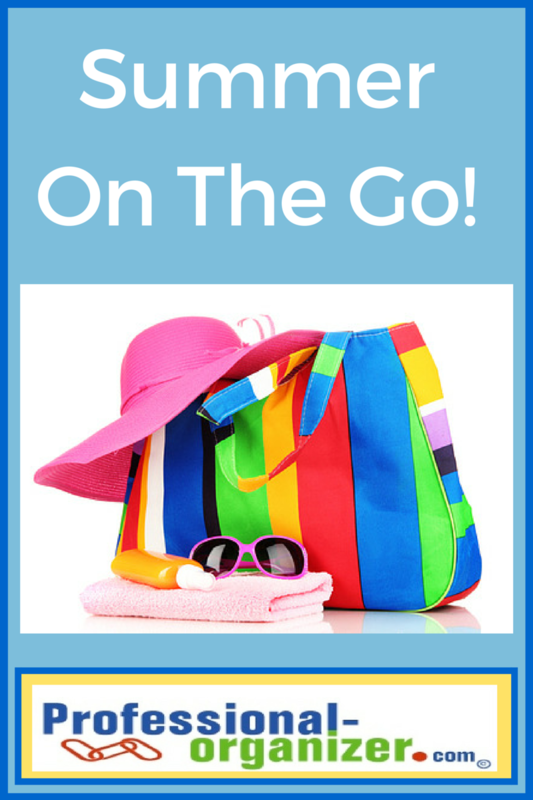 Here are some amazing ideas about summer on the go! When you’re on the go with kids, don’t forget about all the opportunities they’re taking to learn. They’ll learn with or without you, so see what you can do to guide that learning. Pick a shape in the world – ask your children, “How many sides does it have? How many angles?” If you have older kids, ask, “How big are each of the angles? Can you approximate in degrees? If you drew lines connecting one corner to all the others, how many triangles would you make?” And then see what kinds of questions they come up with! If there is one thing I’ve learned with three kids, it’s to be flexible and ready for best-laid-plans to change. More than once we have taken a special trip only to have the boys say their favorite part was the cheap hotel or the breakfast at McDonalds. I’m not saying don’t make plans, but hold them loosely. Realize that all your planning efforts might be trumped by a cool playground or something you would not have expected. And if you are really planning with kids in mind, then let your kids play with the hose outside for an hour even if it was only meant to rinse their hands after a special outdoor activity you set up. I am continually surprised by the things that amuse and impress my kids and long ago abandoned that personal attachment of feeling disappointed when my ideas or plans don’t hold the same allure as something else. Be ready to sit back and watch what brings your children joy, even if it’s NOT your carefully made plans. I have a blog and I’m not afraid to use it. Have FOOD TO GO! Summers are a great time in the Woo household, but also extremely busy. We pack in as many outdoor activities in the short 3 months as possible. My “go to” is a bag of healthy snacks (re-stocked as needed) that I keep in the car. I fill it with Granola bars, dried and fresh fruit, water, nuts, turkey jerkey and healthy things to keep our energy up on the go. It allows us to be more spontaneous. . .quick trips to the beach to swim or fish. . .without skipping a beat! With two teenage-ish boys in the house, I am constantly on the go running them to a friends house or maybe even the mall for a day filled of fun and game. It’s fun for me as a mom, but it can be crazy sometimes. Even though many of these trips are last minute, I try my hardest to plan ahead. By planning ahead, I can make sure that everyone is where they need to be, when they need to be there without overscheduling anything in the process. Love these ladies thoughts! Thanks so much for sharing!